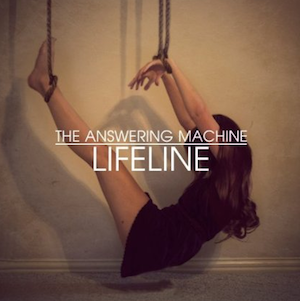 The Answering Machine, four-piece indie-pop band from Manchester, Great Britain have made their final album titled, Lifeline and filled it with biased yet relatable lyrics. Martin Colclough (vocals and guitar), Pat Fogarty (guitar and backing vocals), Gemma Evans (bass and backing vocals) and Ben Perry (drums) made an album that is a little on the oxymoronic side. It’s relaxing, sometimes poppy, sometimes not, and very image evoking. Opening track “My Little Navy,” is a predominantly mellow tune with lyrics that are both desperate and understandable. “Along with my plans that fade with the day… you’ve got me figured out,” sings Colclough. It’s almost humorous how the vocals are upbeat but speaking about a reality that is cold. What made this album appealing to me though were the simple, calm beats and the imagery posed in the lyrics: hospital lungs, transplanted hearts, violent tongues, and bar crawlers in track seven titled “Hospital Lung” grabbed my full attention. The same with the simple beats and guitar in track four, “Three Miles.” The album should primarily be glorified for their portrayal of pessimism while keeping the album catchy, appealing, and relatable.